Manchester United fans are going mad for Luke Shaw this evening after his incredible solo run that led to an assist for the opening goal by Romelu Lukaku vs Crystal Palace. 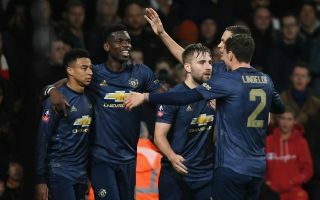 The England international hasn’t always been the most convincing performer for United, and struggled to even get into the team every week under Jose Mourinho for much of his reign. Shaw looks a player reborn this season, however, with fans flocking to Twitter right now to praise his massive improvement, and also even compare his dribbling and skill to Barcelona superstar Lionel Messi. Still, Man Utd fans may be getting a tad ahead of themselves comparing the 23-year-old to a player like Messi, but it just shows how improved their mood has become in recent times. @LukeShaw23 putting in the hard work. Most improved player over the last couple years, especially considering his come back from several injuries. As he said, he’s just going to keep improving ? ?